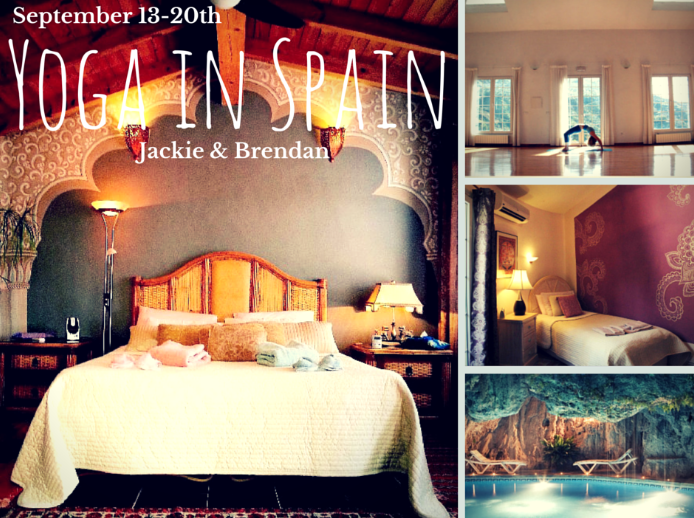 Working with the theme of Sthira (effort) & Sukha (ease) in Southern Spain, Jackie and Brendan will guide you through a week of vinyasa, yin, restorative and meditation with a focus on effort (sthira) and ease (sukha). While exploring these principals both on and off your mat, you will be supported fully by your surroundings in one the worlds top retreat centres. Showcased in Taschen’s ‘Great Yoga Retreats’ book, Molino del Rey is a family run retreat centre built from two ancient water mill ruins, and set in the beautiful nature reserve of Andalucia in Southern Spain. The yoga studio has floor to ceiling windows with views across the valley and a door leading into the inner stillness of the caves. Morning mediation in the caves, afternoons by the pool and planned group excursions that explore Southern spain, this retreat is not to missed. Molino del Rey, our Yoga Holiday Retreat Centre is set in beautiful Andalucian Nature Reserve just 60 mins from Malaga Airport on the Costa del Sol in Southern Spain. $500 Non-refundable Deposit to reserve your spot. A $500 CAD non-refundable deposit is required to reserve a space in retreat. The balance is due on July 15th, 2015. Refunds on the balance are given for cancellations made 1 month prior to the retreat. Credit of 50% of the balance will be given for cancellations made less than 1 month prior to the retreat start date. No credits or refunds will be given after the retreat begins. Jackie Szabo is not responsible for any and all costs incurred for travel arrangements related to getting to this event. Set in the beautiful nature reserve of Andalucía “Sierra de las Nieves” in Southern Spain, with comfort in mind, we have purposely built the entire place with our own hands, improving along the way since as early as 1994. It has everything you would expect from a top yoga retreat and much more. Our yoga retreat facilities are second to none in Spain. In fact the top yoga experts regularly rate Molino del Rey as One of the Best Yoga Retreats in the World. “Molino del Rey” quite simply has to be the best yoga retreat in Spain. ROOMS: We have a max capacity of 22 guest beds. En-suite, balconies, warm/cold air conditioning, superbly comfortable beds, ceiling fans, tea making facilities, safes, hair dryers, alarm clocks, electric blinds etc. Our magical “Grotto” pool is equipped with an automatic Sea Water System & contains no chlorine. For a nominal fee, one has the option of relaxing in our pool-side 14 seater sauna. The studio is 100m2 with wooden parquet flooring and occupies and extraordinary position, hand-cut out of the mountain, floor to ceiling windows with views across the valley and a door leading into the inner stillness of the caves. The latter serves as natural air conditioning in hot summer months. Under floor Central Heating available for winter months at extra cost. The studio has incredible acoustics for working with sound, and is fully equipped with yoga props and training materials. Besides our lovely yoga studio, there is also an aprox. 60m2 teak decking area, for enjoying yoga etc. outdoors. During Summer months, the wooden gazebo serves as a second Thai & Chavutti massage room. We are extremely fortunate in having our own caves, particularly appreciated by meditation groups, and for chanting, overtone, Didgeridoo etc. In fact the whole mountain is honeycombed with caves. Many have been explored by our more adventurous guests ! Let the everyday world slip away with one of our massages or therapies…………. Malaga province enjoys the mildest climate in Europe, with an average of more than 300 days sunshine and low humidity throughout the year.Summers are long, hot and dry. The winter months are usually warmer than early summer in England, with some seasonal rain. Pink clouds of almond blossom heralds the coming of Spring in January, and by March the heady scent of orange blossom permeates the breeze. An ideal time for rambling amongst the myriad varieties of mountain wild flowers. MOLINO DEL REY is well situated for day trips by car to Granada with its famous Alhambra, Sevilla one of the most beautiful cities in Spain, Nerja with its famous caves, Cordoba, Gibraltar, Marbella, and of course the delightful city of Ronda. Beautiful walks, hiking, horse riding, closely situated in one of Andalucia’s most impressive natural reserves. This huge natural park “Sierra de las Nieves” has been designated a Biosphere Reserve by UNESCO, and contains the Abies Pinsapo Boissir, the oldest known species of fir tree found in Europe, just five km from our centre. A spring of the river “Rio Grande” is born at the entrance of our hamlet. From it the purest of waters pour through our centre, offering wonderful bathing facilities whilst surrounded by the wonderful fragrance of mountain flowers. A lovely waterfall is just 5 mins hike from us. Depending on yearly rain fall, the waterfall can be enjoyed most of the year. It is an excellent area for hiking, and immersing oneself in the ambience of unspoiled rural Spain in one it’s best National Parks, or just stay here at our centre and enjoy it’s pool, caves etc. !